A no-compromise tubular perfect for training and racing. 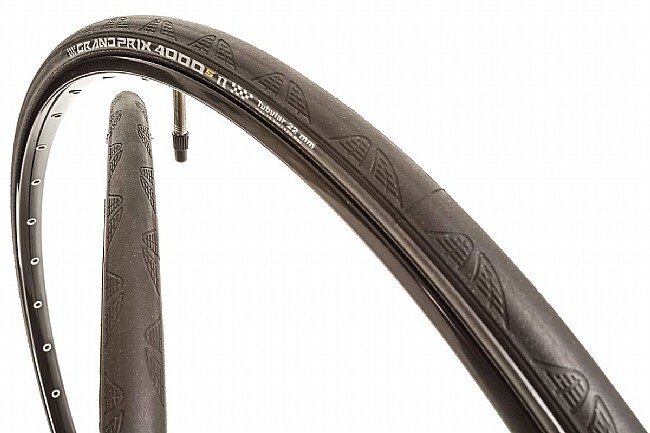 Continental's Grand Prix 4000 S II Tubular Tire is a handmade tubular version of Conti's newest flagship racing and training tire. This updated version of the 4000 SR tubular is just a little grippier, more durable, and faster than its predecessor. That's because Conti is able to improve the performance of their exclusive Black Chili rubber compound, used in this tire's tread, by 3-4% every year, thanks to their continued dedication to research and development. What is Black Chili? It's a unique rubber compound with an ultra-danse construction and high silica content, allowing it to deliver outstanding grip and blazing fast speeds. This cutting-edge compound is also optimized for reliability and longevity, making it a great choice when both performance and durability are top priorities. In addition to utilizing this famous tread compound, the 4000 S II also features Conti's patented Vectran puncture protection breaker. Vectran was originally developed by NASA in the construction and space shuttles and suits, and Continental has brought its otherworldly lightweight protection to bike tires, making these tires impressively flat-resistant. The 4000 S II tubular utilizes a seamless casing for perfect seating on your rims and all-around tire uniformity. Four fabric plies for a total of 240 TPI gives these tires a very supple ride quality. Available in 700c x 22mm. 115-170 recommended PSI. 270 grams.